On the far east side of Notre Dame’s campus lies the Thomas Bulla Farmhouse and surrounding Bulla Road. While students drive the latter frequently, the former is hardly mentioned, visited, or recognized, despite both structures’ namesake acting as a major abolitionist in the era of the Underground Railroad. The University of Notre Dame has a major part of history on its campus, and it’s largely bypassed by the casual observer. Even some Notre Dame students in the History Department say they have little to no knowledge regarding the area’s history related to the Underground Railroad. Senior history major Joe DeLuca said believes local history is essential for the greater understanding of a culture. Notre Dame is not the only location in the now Michiana or even Indiana region that contains rich details of Underground Railroad history. Indiana’s Department of Natural Resources (DNR) as well as The National Park Service have worked to create a comprehensive registry of Indiana’s Underground Railroad locations and features of several Indiana regions. Many fugitives who traveled along this route continued north via Indianapolis. The Georgetown Neighborhood in Madison, Indiana––right on the southernmost border––was at one point populated with abolitionists and freedom seekers. Even today, the Indiana DNR states many of the original homes and churches from the Underground Railroad era still stand in this neighborhood. This includes Lyman and Asenath Hoyt, who would hide fugitives in their family barn loft or cave on their Madison, Indiana, property between 1830 and 1856. In the central part of the state, the Bethel AME Church and the Levi Coffin House once served as Underground Railroad locations. Before it was sold to a private firm in 2016, the Bethel AME Church in downtown Indianapolis was known as the “Indianapolis Station” after it was founded in 1836, but was rebuilt in 1867. The Levi Coffin House located near Richmond, Indiana, also played a significant role in African American slaves’ paths to the north during this time, reportedly assisting over 2,000 slaves to freedom. Before crossing the border into Michigan, thousands of African American fugitives finally traveled through various areas of northern Indiana. The DNR states that just south of the Michigan border and on the shores of Lake Michigan, Daniel Low helped fugitives escape to Michigan or Canada by bringing them from his estate and hiding them on board grain boats at the Michigan City harbor. To the east in Fremont, Indiana, at the Erastus Farnham House, the historic cupola on top of the house served as a watchdog vantage point in order to keep the fugitives he aided safe. Only about 13 miles west is the house of Captain Samuel Barry who, despite being arrested for his actions, frequently provided shelter to fugitive slaves. Still close by in Ft. Wayne, Indiana, the Alexander T Rankin house is, per the Indiana DNR, currently the only known structure still standing in Ft. Wayne that was a part of the Underground Railroad. Likewise, as previously noted, Notre Dame’s Thomas Bulla House was where Bulla and his family aided runaway slaves and still stands amongst residential living buildings on the campus. 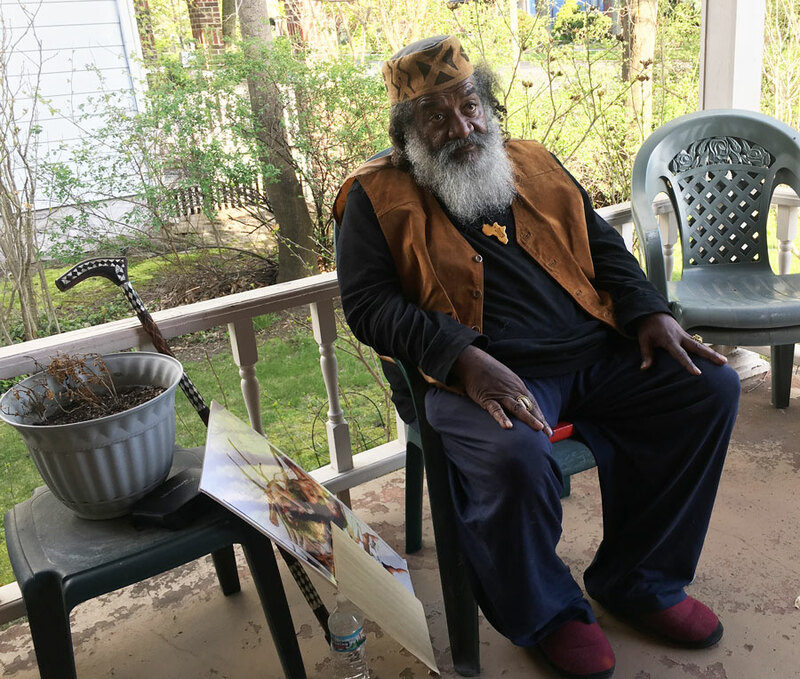 Brother Sage has spent the last 10 years putting together the story of the Underground Railroad’s presence in the Northwest Territory, more specifically the St. Joe Valley Region. This area, what is now northwestern Indiana and southwestern Michigan, saw the passage of tens of thousands of slaves from slave territory to the free land. “What a lot of people don’t realize is that the No. 1 region for runaway slaves was the Kentucky, Ohio, Indiana, Illinois and Missouri region… to think that 75,000 people escaped that particular region is so awe-inspiring. These stories need to be told,” Sage said. South Bend also was home to plenty of abolition-era dramatics, with the South Bend Presbyterian Church halting slave catchers from removing runaways from free-Michigan back to slave-Kentucky. But auction-block documents printed by what is now known as the South Bend Tribune have also been discovered. These flyers advertise the sale of Michiana-area men, women and children, cementing the fact that the oppression was local. “This just goes to show how rough it was on us, what kinds of things we had to go through [in this area], and why it’s important for us to talk more about this from the standpoint of whoever you are,” he said. Sage stressed the necessity to rectify an ignorance of history by sharing these stories and this knowledge through education and traditional schooling. 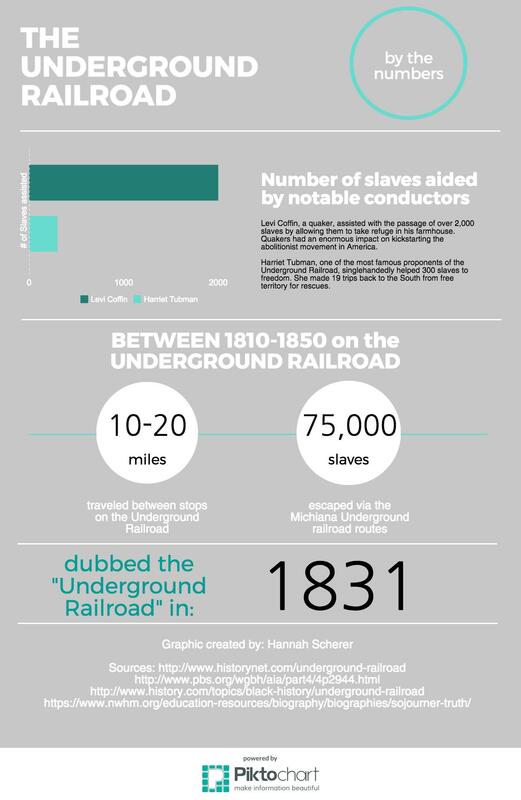 While information on these historical locations is becoming more available through online registries, Indiana’s regional history in terms of the Underground Railroad has not shown to be well-known. “They don’t know what we had to go through in order to be free, they don’t know anything about the real bigotry or prejudice we went through, or they don’t know anything about the history [of the Underground Railroad,]” Sage said. Lacking such pertinent historical information takes away part of a community’s culture. This causes the loss of a potential lesson learned, or an honorable historical connection. “[The Thomas Bulla House] can be a source of pride for the community and the people who live here that we played a significant role in helping free slaves, not mentioning it is a very interesting topic of discussion around campus,” Lew said. Becky Savage stood in front of a screen displaying the beaming faces of her two sons Nick and Jack as she recounted the day in June 2015 that changed her life. “I am a nurse and I am trained in saving people’s lives. That day, I could not perform my job as nurse, and I could not perform my job as a mom,” Savage recently told a room full of parents at St. Joseph High School. Savage shared her story of immense loss: Her sons Nick and Jack died of an accidental drug overdose after attending a high school graduation party in Granger, Indiana, on June 14, 2015. The brothers had consumed a combination of alcohol and prescription painkiller oxycodone on the night they died. The pair of hockey players were “smart kids with bright futures,” Savage said. And with one bad decision, her sons went from college kids to adding two more to the growing count of opiate-related deaths recorded both locally and nationwide. America’s drug problem has been called an epidemic on the covers of national magazines and in local anti-drug forums such as the one Savage spoke at in April. St. Joseph County in Indiana has been no exception. In 2015, deaths from overdoses in St. Joseph County reached 59, which outnumbered total deaths from homicides and fatal car crashes combined. That number has more than doubled since 2012, when 26 overdose fatalities were reported. 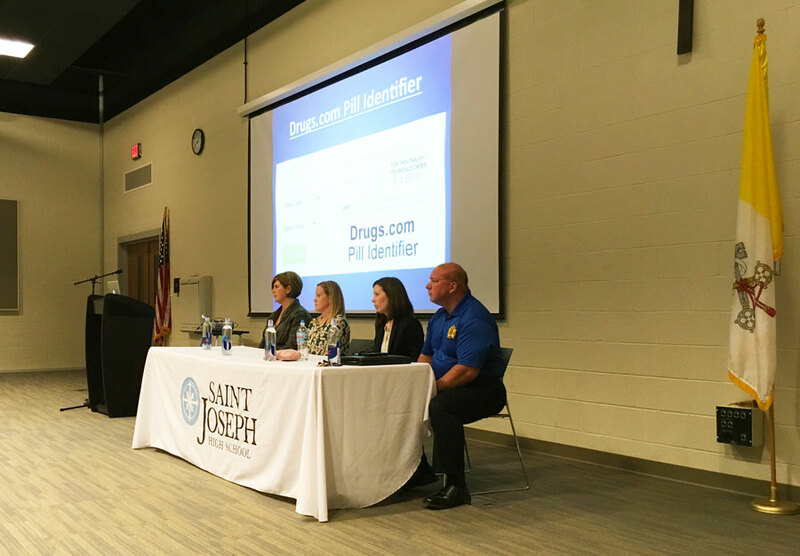 The St. Joseph County Drug Investigations Unit (DIU) was formed in January 2016 to address this rising drug epidemic. The DIU, led by Commander Dave Wells, is focused primarily on overdose fatalities and armed drug traffickers. The unit has been fully staffed and running since March 2016. The DIU’s duty is not only to investigate, but to also inform and educate the public by talking to schools and parents about prescription drugs and signs of abuse. St. Joseph County tallied 58 deaths due to drug overdoses in 2016, one less than in 2015. Of that number, 39.65 percent were caused by heroin overdoses, nearly ten percent less than the year before. According to St. Joseph County Deputy Prosecutor Amy Cressy, South Bend drug dealers are increasingly turning to heroin because of accessibility and lower prices. But work has suggested that opioids in general are the biggest problem. The DIU was specifically designed to handle the opioid epidemic in St. Joseph County, Wells said. The DIU’s goal is to target the people who deal those drugs and feed people’s addictions. As drug abuse increases in St. Joseph County, treatment facilities are experiencing a significant increase in referrals and people being admitted into treatment, according to Kristin Tawadros, a psychologist at Oaklawn Psychiatric Center in South Bend. But facilities like Oaklawn lack the resources and funding to accommodate for the increasing number of referrals, said Tawadros. “We can’t arrest our way out of all this. There’s people that obviously need therapy and need help with that,” Wells said. “Most people who use heroin, who use drugs are not typical criminals, they’re addicts. “Education is the key. Right from the start. Getting to our kids.” As part of his role with the DIU, Wells speaks on the subject of drug abuse in the community as much as possible. “I always say, we have a PowerPoint, we’ll travel. If you want us to come and do a presentation for your school, we’d love to come talk to your kids,” he said. Wells and Cressy spoke following Savage’s story at Saint Joseph High School as part of one of their educational outreach events. All three speakers drove home the same imperative message that necessary information about drugs and addiction must be shared and discussed. 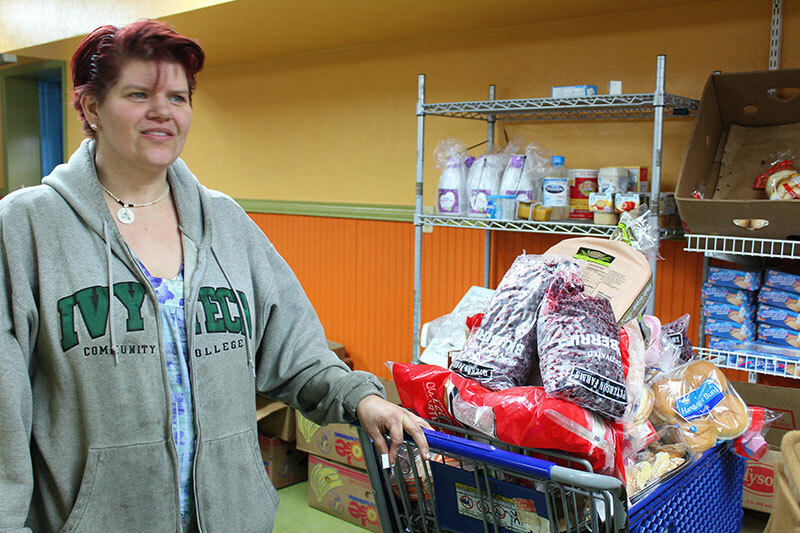 Jennifer Lundy, a South Bend resident, rolled her cart up to the counter at the Food Bank of Northern Indiana. The cart was filled to the brim with produce and non-perishables to be taken home to her three daughters, her niece and nephew and her mother. In Indiana, the average food insecurity rate between 2013 and 2015 was 14.84 percent, according the United States Department of Agriculture. This was more than a full percentage point higher than the national average in the same time period. Households ranked as having low or very low food security, as defined by the USDA, were included in those numbers. Across Indiana counties, the food insecurity rate varies widely. According to Feeding America, in 2014, the lowest county food insecurity rate in Indiana was 9.4 percent in Hamilton County, just north of Indianapolis. The highest was 19.4 percent in Marion County, where Indianapolis is located. St. Joseph County, where the Food Bank of Northern Indiana is located, had a food insecurity rate of 16 percent. In Indiana, the food insecurity rate increased slightly in the early 2000s, spiked in 2008 and continued to rise slightly through 2015. According to the US Census Bureau, the average food insecurity rate in Indiana from 2010 to 2012 was 13.5 percent. The increase reflects a national trend. Shane Turner, a South Bend resident, recently began volunteering at the food bank. He was exposed to the facility by his girlfriend, who used to work there. Turner decided he wanted to use his time to help make a difference in his community. The pantry area where clients pick out their items is just a small part of the facility–a large storage area, complete with freezers and huge bins for sorting goods, extends beyond the pantry. The food bank currently has eight volunteers and two full-time staff, and the volunteers logged almost 50,000 hours last year in order to serve thousands of clients, according to Jaime Owen, an agency relations manager. Turner said he hopes to be hired as a full-time staff and become more involved with the food bank. “I just wanted to come here and do something,” he said. His current duties involve packing food, clearing freezers and loading and unloading deliveries. In Indiana, according to the USDA, 73 percent of eligible participants used SNAP in 2010. In 2014, 13.5 percent of Indiana’s population participated in SNAP and the number of participants increased by 2.53 percent from 2009 to 2014. Another way of tracking hunger is through the concept of “food deserts,” which examines access to food by comparing the locations of the closest grocery stores, the income levels of the inhabitants and whether people have access to a vehicle. In 2010, 33.77 percent of individuals in St. Joseph County had ‘low access’ to food, though only 9.17 percent were low income and had low access to food. Only 1.54 percent of households had no vehicle and low access to grocery stores. “Whenever I think about food deserts, usually it’s not a big issue, but on an individual level it could be,” Gundersen said. The Food Bank of Northern Indiana is a member agency of Feeding Indiana’s Hungry, and it works with about 200-member agencies–more than half of which are food pantries. The others are soup kitchens, shelters and other food services for low-income people. Owen said the Food Bank of Northern Indiana encourages all of their pantries to be client choice, meaning they mimic grocery stores in their set up. 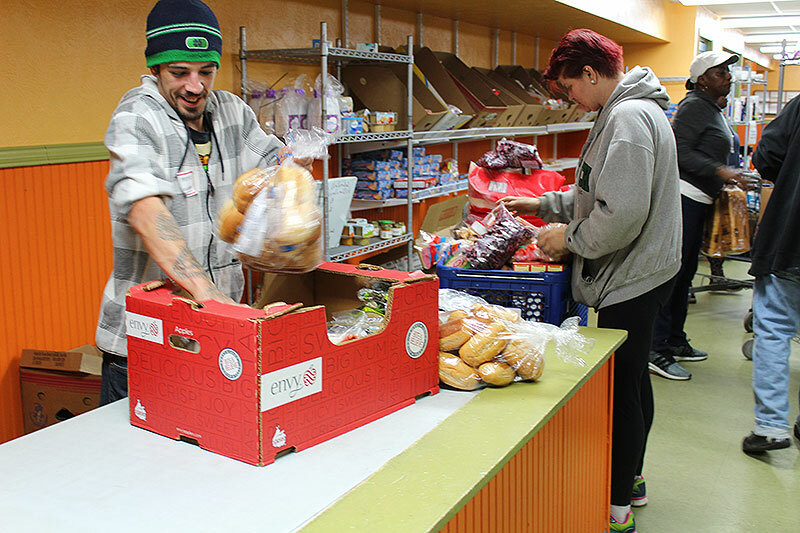 Unlike the traditional food pantry, which prepacks boxes for clients, at a client choice pantry, users are given a set number of each type of item that they may take (carbs, veggies, hygiene products, meat, etc.) based on the number of people in their household. Then they use a shopping cart to collect their food and “check out” with a volunteer. Aside from their home pantry in St. Joseph County, the Food Bank of Northern Indiana works with several counties in the area with several different programs, including a “Food for Kids” backpack program and a mobile pantry, which travels to rural Stark County once a month. “If we knew the answer [to solving food insecurity], we wouldn’t need food banks and food pantries,” Owen said. In the heart of South Bend’s East Race district sits a tiny brick building with a wide-reaching impact. “PURPLE PORCH CO-OP” is spelled out in iron letters over a door through which a constant stream of people flow. Inside, the small space is packed with shelves of whole foods, vibrant produce and a cozy cafe with smells that waft through the store. “Knowing that I’m coming here to get some great food and also support the community just makes it more worthwhile,” said Kathleen Darling, a Purple Porch shopper. Darling, a student at Notre Dame, regularly visits the market and cafe to stock up on groceries and enjoy lunch from the salad bar. 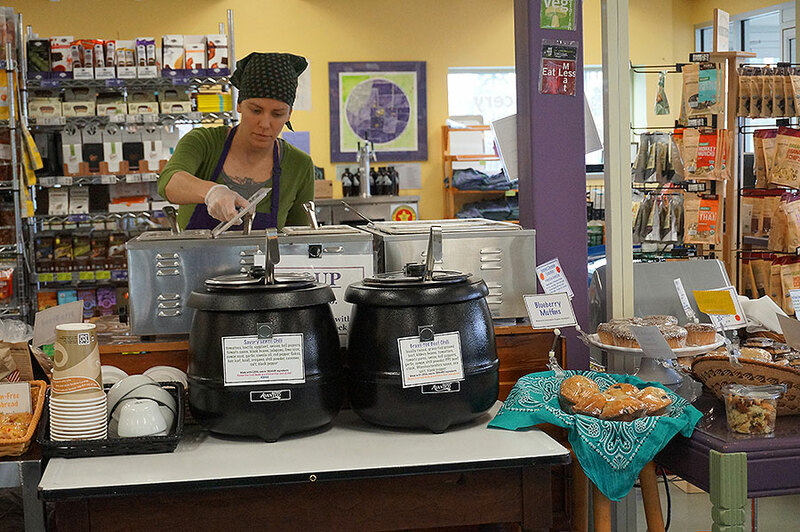 The Purple Porch’s local market serves as community center, and the grocery store, cafe, and weekly farmers market provide city-dwellers access to sustainable and local foods right in the heart of urban South Bend. Food co-ops have gained popularity around the country as a way for shoppers and producers to become more involved in their food choices. And Purple Porch is no exception. The market is community-owned, democratically run, and has given shoppers a more transparent, sustainable and local grocery experience. About 10 years ago, the co-op began as a weekly farmers market that brought together Michiana farmers with South Bend consumers. The goal was to combat a lack of fresh, locally-sourced foods within the city. Over time the market grew, and by 2009 the member-owners of the co-op decided to rent space at Lang Lab on High Street, which houses up-and-coming business ventures in the city. An explosion of popularity after this move allowed the co-op to eventually buy their own building on Hill Street, which today contains the market/cafe and operates seven days a week. Despite the growth, employees say the Purple Porch still retains the core values on which it was founded: local, sustainable, and transparent. The market specializes in locally grown and organic products from daily fresh produce to personal care items, and operates business with local farmers and producers between a 60-mile radius (local) to a 400-mile radius (regional) around South Bend. While the United States Department of Agriculture (USDA) defines local as a 400-mile radius, Purple Porch Co-op focuses heavily on products grown and produced within a 60-mile radius around South Bend. Dr. Susan Blum, a professor of Anthropology at the University of Notre Dame, said she has a strong passion for local food and the Purple Porch. By supporting neighbors, mitigating unequal economies, and bringing wonderful food to people who would otherwise not have access, she said she believes that co-ops such as the Purple Porch serve as epicenters of positive community change. She was instrumental in structuring the co-op’s founding principles of sustainability, local sourcing, community involvement and transparent production. The Purple Porch has grown significantly over the past several years, yet it continues to host the farmer’s market on a weekly basis every Wednesday. From Spring through Fall, local farmers and producers load up their trucks, drive the short distance to the co-op and set up tents in the parking lot. Local shoppers can browse the variety of fresh goods, as well as order online ahead of time to pick up their goods direct from the vendors. The cooperation agreement indicates that Purple Porch only collects a 10 percent surcharge on all sales at the Wednesday market, giving local farmers a wider platform to sell their products and make a profit. Purple Porch Co-op aims to encourage communications between buyers and sellers and to support local food production. “Local means knowing the people that you work with and being able to advocate for farmers… to help them grow their business,” Robinson said. According to the farmer’s market policy, customers can meet and interact with local producers, so that consumers can better understand the growing process and where their food is coming from. The online order services provided by Purple Porch Co-op helps local farmers to save time and budgets for knowing the amount of products that they should bring to the market. Market sellers are producing their food within a 60-mile radius of South Bend, which guarantees the food quality. A “food desert” is defined as a low-income urban area that lacks access to grocery stores or healthy food options. For many living in these areas, supermarkets are often several miles away, restricting options to unhealthy fast food or convenience stores. Dr. John Brett, a professor of Anthropology at the University of Colorado-Denver, recently finished research that examines the reason why the Park Hill neighborhood in Denver — one of the city’s wealthiest areas — has some of the highest rates of food insecurity. “The key is not about convincing the community to let us come in, but is about to accepting the community as partners,” Brett said. He stressed the need for “experts” in the field to listen to the life stories and experience of people living within food deserts. Greater understanding and compassion for the individuals affected by this crisis is crucial for treating the problem in the first place. He said that enhancing the already existed resources is the easiest way to make a change in a food desert, for instance, trying to get funding to add fresh food items in convenience stores. Food insecurity is essentially a systematic and ethnic problem, experts say. Brett offered an example of how food access matters on elderly. Our reporting team researched data on stories of growth and change in communities outside of South Bend, Indiana, and visualized that data using Google Earth Pro and Earth Engine Timelapse. The videos and graphics show radical change to some of the world’s rapidly changing areas. The state of Montana has voted Republican in every presidential election since 1992, when Bill Clinton won 37.63 percent of the popular vote to beat George H.W. Bush. Bush received 35.12 percent of the popular vote that year. In the 2016 election, when Donald Trump won 55.6 percent of the popular vote in Montana, six counties voted for Hillary Clinton: Missoula, Glacier, Big Horn, Gallatin, Deer Lodge and Silver Bow. Deer Lodge and Silver Bow counties have voted for the Democratic candidate in every presidential election since 1956,* even in 1972 when every other Montana county went for Nixon. The story of Silver Bow county is a unique one in the history of Montana and the United States. Up until the 1930s, it was the fastest growing county in Montana, with a booming copper industry. Now, it has a population of 34,523 (2013 numbers) and the entire area is on the EPA’s National Priorities list. The EPA gave the “Silver Bow Creek/Butte Area” a site score** of 63.76, the highest in Montana. A Google Timelapse showing an aerial view of the area since 1984 and the growth of the Berkeley Pit can be found here. The growing pit or lake in the top part of the frame was once home to neighborhoods that lived on top of the mines that made Butte a destination for European immigrants. Open pit mining in Butte began in 1955, when copper prices were the highest they had been since World War I. The accessible parts of the Butte mines had already been mined, but the Anaconda Company sought to continue to profit from its mines there. Butte was originally founded as a gold and silver mining camp, but it became prosperous in early 20th century during the copper boom. The tour begins on the Beara Peninsula, near Skibereen. What Emmons calls Queenstown is today known as Cobh, a port town in County Cork, Ireland. *In 1956, Silver Bow county voted for Dwight Eisenhower, while Deer Lodge still voted for the Democrat Adlai Stevenson. In 1924, Silver Bow voted for the progressive candidate, Robert Follette. In 1904, Deer Lodge voted for Theodore Roosevelt. In every other presidential election, both counties have voted for the Democratic candidate. This timelapse shows satellite imagery of deforestation in the Amazon rainforest from 1984 to 2016. This section of the Amazon rainforest is located in the Codajás municipality of the Amazonas state. Zoom in to see the individual settlements that have cut deeper and deeper into the rainforest over time. Roads into the rainforest widen as deforestation increases. Deforestation is used by the logging industry, as well as for farm, industrial and settlement use. The Amazon rainforest has lost 294,366 square miles in total since 1970. “Save the Rainforest” protests prompted significant decreases to illegal logging, but deforestation has been back on the rise since 2015. These increases threaten Brazil’s ability to successfully complete the Paris Agreement commitments it made in 2016. Hong Kong International Airport opened in July 1998 and was built largely on land reclaimed from the sea. The airport is currently 4.8 square miles with two runways, though it’s expanding to three runways and is rapidly forming more land to accommodate the growth. Hong Kong International Airport is the world’s most profitable, and Skytrax rankings recently named the airport the fifth best in the world, as voted by air travelers. Along with the rest of the Western United States, Lake Mead in Nevada is suffering from the ongoing drought. The water levels have shrunk substantially from 1984 to 2016. In the past, the reservoir has provided 90 percent of Las Vegas’ drinking water, yet federal water managers are now predicting that the lake will not have enough water to fulfill deliveries to Arizona and Nevada in 2018. Las Vegas, Nevada, is one of the fastest growing cities in America, and the shrinking of its main fresh water supply is not something that will help the rising population levels. According to CBS News, the water levels of the Lake Mead reservoir were down more than 60 percent from their capacity in May of 2015. In September of 2015, the reservoir was down 147 feet from full capacity, and only 38 percent full. In 2016, the reservoir was just 36 percent full, and only keeps shrinking. What exactly is causing this shrinking? Lake Mead is the largest reservoir in the United States, and is fed by the Colorado River and its tributaries, which are fed by snowmelt from the Rocky Mountains. Since the Southwestern United States and the Colorado River Basin have been experiencing a drought for the past fourteen years, there just isn’t as much water flowing in the system. Although the snow should still be melting, the winters have been uneven and the precipitation has been below average, due to warmer temperatures and global warming. All of these factors in combination have contributed to the drying up of Lake Mead. The drought is not going away anytime soon. The chances of a 35-year or longer “megadrought” striking the Southwest and central Great Plains by 2100 are above 80 percent if the world stays on its current trajectory of greenhouse gas emissions, according to scientists from NASA, Columbia University and Cornell University. Dubai has experienced quite the transformation over the past few decades. It used to be known mainly as a small trading post and oil producer, but has become a a growing target of investment and an emerging tourist destination. Dubai wants to become “the smartest and most sustainable city,” according to the Wall Street Journal. The impetus of Dubai’s transformation was when it became a member of the United Arab Emirates in 1971. Dubai, which is now home to approximately 2.5 million inhabitants, now boasts the Burj Khalifa, the world’s tallest skyscraper. Myrtle Beach, South Carolina, is one of the most popular vacation cities in the United States. It’s also one of the nation’s fastest growing cities. According to Steve Jones of The Sun News, Myrtle Beach was the nation’s second-fastest growing metropolitan area from 2014 to 2015. Though people of all ages have been moving to Myrtle Beach, a lot of the city’s recent growth can be attributed to retirees. Myrtle Beach is famous for beautiful beaches, and rapid economic development has accounted for the construction of a bevy of other attractions, such as golf courses. When asked to think of cities associated with technology, one usually thinks of the coasts. Areas like Silicon Valley are usually seen as the key locations behind the modern industries of the 21st century. But in recent years, Indianapolis — and the state of Indiana — have become major players in the industry too. Just last month, Forbes placed Indianapolis fifth among cities creating the most tech jobs, while Governing Magazine wrote about the city’s surprise success in the tech industry. Echoing a similar sentiment expressed in his State of the State address, Gov. Eric Holcomb called on Hoosiers to embrace Indiana’s potential as a tech state in a recent letter to the Indianapolis Star. This infographic shows the success of Indiana — and Indianapolis in particular — as a key location for tech jobs. Indiana falls just around the average, coming in as number 22 on the list, with 41 percent of its residents saying they were “Very Religious.” Vice President Mike Pence hails from Indiana, and is known for his commitment to Evangelicalism, yet this is not the trend for the majority of Indiana residents. Vice President Mike Pence is known for his evangelical faith. His commitment to the “Billy Graham Rule” made national headlines last week. Pence’s home state of Indiana is also widely regarded as religious. The craft beer industry is experiencing tremendous growth in the U.S. in recent years. According to the Brewers Association, the craft beer industry now represents 12 percent market share of the total beer market, more than double than what it was in 2011. The following infographic shows where Indiana ranks among the nation in this craft beer craze.